Zombie Candy ~~ Will you turn into a Zombie if you eat the Candy? Who knows and Do you Really want to find out? Wow this month has flown by! This is the last full week of the challenge! Each Sunday, along with the challenges of the week, I’ll post that week’s daily Halloween themes here. You can respond daily or weekly, however you choose, just keep it spooky! Share an image, write a poem, make a collage, you choose how to creatively respond. Anything goes! If I eat Chia seeds will a Chia pet take root within my internal organs and begin growing inside my body? Then when I least expect it start sprouting from my ears, nose, mouth and even my pores? Or in 9 months will I give birth to a baby chia monstrosity? 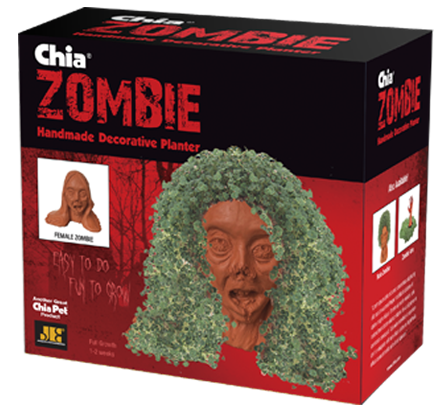 When the townsfolk in their distrust and horror chase me down, stab me in the heart with a stake, shoot me with a silver bullet then bury me in unconsecrated ground and when I arise during the full moon covered in greenery will I be a Chia Zombie? Will I in my zest and haste to grow and be powerful consume an entire box of miracle grow turning myself into an Avenging Green Warrior for Mother Nature? If I should be redeemed by a traveling oracle will I then join forces with the Alfalfa and the Omega? Chia seed points to ponder.